A visually stunning cello that shines bright under the showroom lights. The bold antiqued finish is a deep red-brown over a golden ground that gives it a fiery look. The tone is also bold, with an extremely clear voice; big sound potential throughout, yet with a uniquely rich quality that carries evenly across all registers. 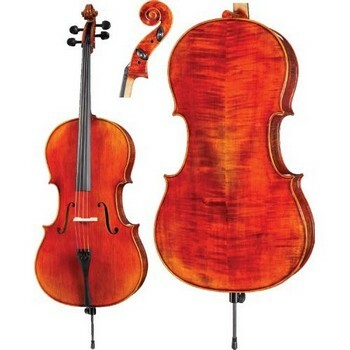 The Johannes KÃ¶hr K515C is an excellent instrument for intermediate players seeking more range and personality. Made in limited quantities. Fully carved. Ebony fingerboard and Parisian eye pegs, Despiau "D" level French bridge, Glasser tailpiece with integrated tuners, and endpin.